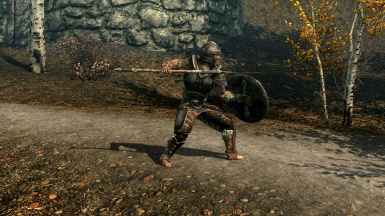 This mod adds a variety of 1 handed spears and throwable javelins into the game. You may not upload this mod to any website without my permission. You may not upload or use any of the assets from this mod. You may upload translated versions of this mod provided it is made clear that you are NOT the original author of the mod and that you contact me afterwards. -There is a variant in each base material. i.e Iron, Steel, Elven, forsworn, imperial, draugr, etc.. The spear has been used by almost every civilization. They are cheap, easy to make and require little training. They are essentially the perfect weapon for the battle field. And in the words of wikipedia "The spear was the most common weapon of the peasant class of Scandinavia and also throwing spears may have been used by the warrior class.... Compared to a sword, the spear can be made with inferior steel and far less metal overall. This made the weapon cheaper and probably within the capability of a common blacksmith to produce. Despite this, the spear held great cultural significance to the Viking warrior"
The spears are all 1 handed with custom animations. They do more damage than swords, however they are also a little bit slower so the Overall damage per second is slightly lower than a sword of the same material. HOWEVER, they do more critical damage, have a much longer reach and ignore 25% of armor. So overall they are essentialy equivalent to swords. There is a spear in every material type. ie. iron,steel,dwarven,orcish,imperial,forsworn,draugr,etc. regular attacks do not have thrusting animations, they will use the vanilla 1 handed animations. regular attacks do less damage, however they have a large reach and can hit opponents within 80 degrees from where the player is aiming. Regular attacks should only really be used if you are low on stamina. 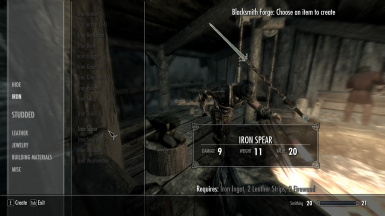 All spears are craftable at forges, They require the same ingredients as swords with the following modifications, 1 less ingot, 1 extra leather strips, 2 firewood. They can also be upgraded. 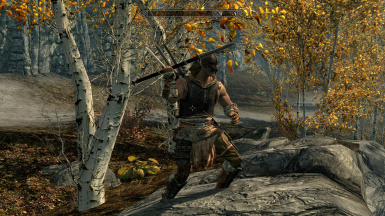 The chance of a NPC having a spear is slightly higher than other weapons, however this only applies to NPC's that would normaly have a 1handed weapon. 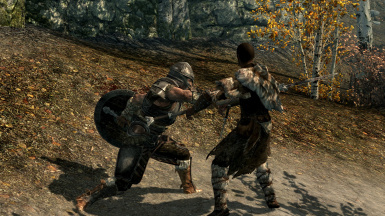 NPC's that would normally have 2 handed weapons will not have spears. Javelins have custom throwing animations and are equiped as seperate weapons. They function kind of like arrows that don't need a bow. When you equip javelins they will appear on your back in the game. If you click and hold the left mouse button, you will draw a javelin and hold it over your shoulder. You can then aim until you release the left mouse button, when you do you will then throw the javelin. They will stick into the environment and NPC's and there is a high chance of being able to recover thrown javelins. Javelins do 2x the amount of damage as an arrow of the same material as well as staggering your opponent, they also ignore 25% of armor. The downside is that each javelin has a weight of 3 units, and they are 3x as expensive as arrows. There are javelins in every material type.ie. iron,steel,dwarven,orcish,imperial,forsworn,draugr,etc. 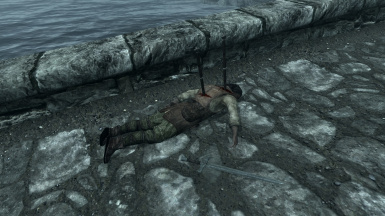 NPC's that would have a bow in the vanilla game will have a chance of having a few javelins with this mod. Unlike arrows, NPC's will not have infinite javelins, and they will usualy throw about 2 or 3 before switching to a bow. Javelins will use the archery skill tree, which also means they will benefit from all the archery perks. NOTE: Unfortunately I have been unable to get 1st person animations to work, so the vanilla 1st person animations will still play. Please follow these instructions fully and carefully, I have been as precise as I can so please don't skip any steps. 3. Go to this page http://www.nexusmods.com/skyrim/mods/14871/? 5. Open the compressed PCEA folder you just downloaded. 7. Select ONLY the following files/folders "behaviors","characters","characters female","defaultmale.hkt","defaultfemale.hkt"
8. Extract these files/folders to the following location, "YourTemporarySpearsBySoolieFolder\Meshes\actors\character\"
9. Check that this location now has the following files/folders "animations", "character assets", "behaviors","characters","charactersfemale","defaultmale.hkt","defaultfemale.hkt"
11. Copy them to the following location "YourSteamFolder\steamapps\common\Skyrim\Data\"
12. Go to this page http://www.nexusmods.com/skyrim/mods/11811/? 13. Click on the files tab and manualy download "FNIS Behavior V5_2 -- ALWAYS necessary"
14. Open up the compressed folder you just downloaded and navigate to "FNIS Behavior 5.2\Data\"
15. Select all the folders in this location and extract them to "YourSteamFolder\steamapps\common\Skyrim\Data\"
16. Go to the following folder "YourSteamFolder\steamapps\common\Skyrim\Data\tools\GenerateFNIS_for_Users"
21. Go to the following location "YourSteamFolder\steamapps\common\Skyrim\Data\SkyProc Patchers\Spears By Soolie\"
Also, before you run the patcher after the first time. make sure you delete 'Spears By Soolie Patch.esp' first, so it can generate a new one. 25. It would be best if you start a new game after installing this mod. It should work with old saved games, but I can't guarantee it. 26. Make sure you read the Known Issues or bugs section of this readme, so you know how to fix some problems that may occur. 1.For some reason the game will struggle to load the custom animations if you are running low on ram. If this happens you will see things like NPC's having to play the throwing animation multiple times before the javelin is actualy thrown. Also the first time an animation is played it may not work i.e the first time you use a thrust animation it may skip it, however it should work fine after that. To fix this problem make sure you always close background programs before playing the game to free up ram. 2. 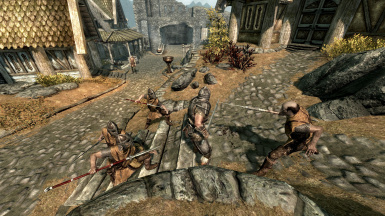 Very rarely the game will crash when a NPC equips or unequips javelins, the chance of this happening is slightly higher if there are many NPC's attacking you with a spear or javelins, such as if you are being attacked by many guards. As a precaution, make sure you do a quicksave before entering such situations. 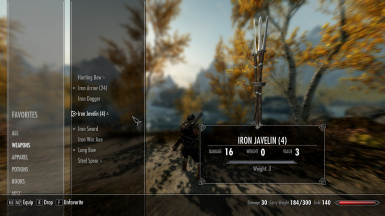 If you have made a spear or javelin and you would like it to use the animations from this mod, simply make sure the word "spear" or "Javelin" is either in the items ingame name or it's editorID also, the inside the .nif, the weapon should be sheathed in the regular 1handsword weapon spot, not on the players back. Also it must be set as a 1 handed sword for spears, or an arrow for javelins. The mod has a patcher that should make it compatible with just about everything.